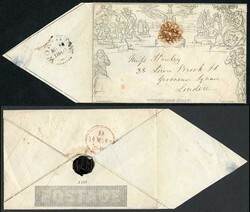 Cavendish Philatelic Auctions Ltd.: Cavendish Auktion - 814 - Great Britain Stamps & Postal History Auction already ended! 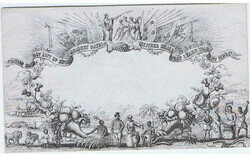 c1840 Valentine 'Peace Envelope' depicting 'Peace'...more c1840 Valentine 'Peace Envelope' depicting 'Peace' receiving representatives from various races with a scrolled inscription “ NATION SHALL NOT LIFT UP SWORD AGAINST NATION NEITHER SHALL THEY LEARN WAR ANY MORE.” Very fine condition. 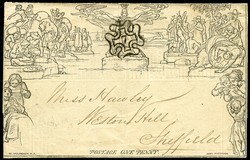 1840 Mulready 1d envelope, Forme 1, A131, to Alnwick from...more 1840 Mulready 1d envelope, Forme 1, A131, to Alnwick from BELFORD, Northumberland, with a JU 13 1840 datestamp on the reverse. Belford is a small village between Alnwick and Berwick-on-Tweed in Northumberland. Fine. 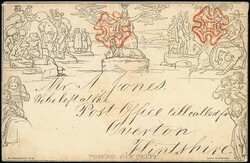 1840 1d Mulready Envelope, Stereo A10, to Taunton, Somerset, with...more 1840 1d Mulready Envelope, Stereo A10, to Taunton, Somerset, with a red Maltese Cross canceller and a two line T. P. Hampstead handstamp, both on the front. 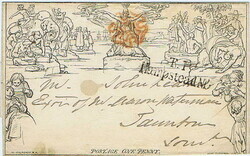 On the reverse is an OC 6 1840 datestamp. 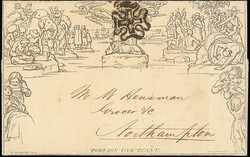 c1840 Valentine 'Universal Brotherhood' envelope with...more c1840 Valentine 'Universal Brotherhood' envelope with scrolled inscriptions “ARBITRATION FOR WAR / UNIVERSAL BROTHERHOOD / FREEDOM OF COMMERCE.” Very fine unused condition. 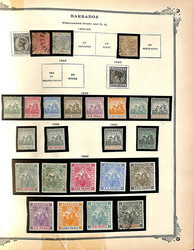 Worldwide, Magnificent Old Time Stamp Collection, 1840-1918. 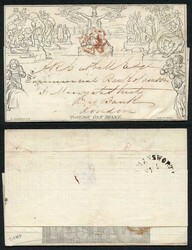 In three...more Worldwide, Magnificent Old Time Stamp Collection, 1840-1918. 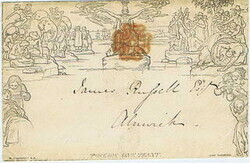 In three old time Scott International large bound albums of lovely gilt edged pages, with stamps carefully mounted and generally correctly identified with some highlights that include: Antigua 21-30, 31-38, Argentina 122//142 (only missing one of the 15c shades), Australian States - New South Wales 115-19, Austria 128-44, Azores 149-54, Barbados 81-89 mixed mint and used, 90-101 mint, Brunei 1-12, Newfoundland partial mint first Guy issue, 104-14, 115-26, Canada 14, 46-47, 54 mint, 56 mint, 99-100, 119 mint, E1 mint, Cape of Good Hope 4p blue triangle, a few early Ceylon perf and imperf early Chalon heads, Chile 98-112, China 1c early mint Imperial Dragon, Crete 111-20, early Cuba with great Isabella II, Espania, Alfonso XII and XIII issues with some surcharges, Dominica set of mint Edward VII set to 5/-, East Africa and Uganda Edward VII set to 4R, Falkland Islands 22-29, Fiji Edward VII set to 5s, great selection of early perf and imperf France Ceres and Napoleon issues with some denominations up to 1 Fr and 80c, 95 mint, some good French Peace and Commerce overprints in French offices section, Gambia Victoria silhouette's up to 1 shilling, Edward VII set to 3s, some interesting early German States, decent Imperial Eagles, 28 mint, Gibraltar Edward VII set to L1, Gilbert and Ellice Islands 3-7b Great Britain 1 (2), 2, 5-7, Victorians with a high level of completion including 5/-, 94-95, 10 shilling Victoria, 111-22, 138 mint, U1 Mulready Envelope, Guatemala 7-10, 17-20, Hong Kong 84 mint, 104 mint, Iceland Kings Christian IX and Frederik VIII bust set, Frederik VIII silhouette bust mint set, India 6, 72-73 mint, several Convention States mint Victoria or Edward VIII sets, Indo-China 24-38 mint, 41-58 mint, Ionian Islands 1-3, useful early Italy with 58-63, Ivory Coast 21-36, Leeward Islands Edward VII set to 5s, Macao 17-21 mint, 22-23 mint, 35-44 mint, 46-57 mint, 147-57D mint, J12-22 mint, Madagascar 77, Malaya several $1 and $2 mint Elephants and Howdah issues, Malta 17-18 mint, 21-27 mint, 28-45 mint, 60 mint, Mauritius 124-26, 137-51 mint, Natal Edward VII mint 10s, 110-16 mint, Netherlands 1-3 used, British New Hebrides 1-6, New Zealand 119-20, Nyasaland Protectorate 1-10 mint, Papua Lakatoi mint set to 2/6, Portugal 185-92 mint, 193-98 mint, Rhodesia 76-79 mint, 101-17 mint, Romania 196-206, St. Helena 50-55, St. Lucia 56, Spain 287-94, 297-305 mint, Straits Settlements Edward VII to $2, 134A, Sweden J12//J24 (only missing 24o gray lilac), Switzerland 2 with APS certificate, 7 with APS certificate, 8, 10, 12, 13, a type set of imperf seated Helvetia and 145 mint. 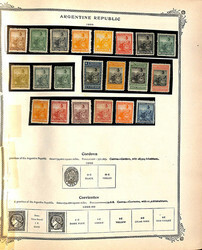 A fabulous old time collection of issues through the first nearly 80 years of philately that would be wonderful to expand and share with others., generally Fine to Very Fine appearance. Estimate $5,000 - 7,500.